When it comes to packing for your next move, it’s all about the labeling. Every box should be labeled for the room it is going into. There should also be a quick inventory of what’s in the box. For instance, you would certainly want to know which one of the dozen kitchen boxes has the coffee machine. At your new home, you should also post signs on the doors of the room so the movers know which bedroom is which. One label you never want to put on a box is “junk.” You want to keep that clutter far away from your new home as possible. That is where Junk King Worcester can make a huge difference. One call to Junk King Worcester will put a plan into action that will insure you’re not bringing any unwanted clutter with you to your new home. As with your other movers, Junk King is going to provide a strong team capable of lifting and loading anything you want to get rid of. Size or weight is never an issue for Junk King. Think about an old sofa you don’t want to take with you. It shouldn’t go on the moving truck. That would force out other items that you definitely want to take with you. That can end up costing you more if your movers have to make a second trip. Once you’ve decided all the things you want to get rid of, call up Junk King to set up your appointment. You might find that they could swing by in just a few hours. That would certainly be a huge relief. Most other appointments are cleared within 24 hours. All the things you want to get rid of might still be useful; just not to you. 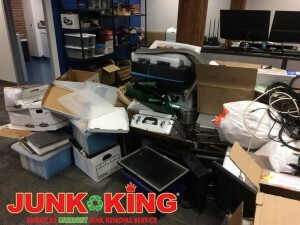 With Junk King on the job, you can count on those items getting dropped off at a local charity. How old something is or if it has a broken leg or ripped cushion won’t be a problem. Many of these charities specialize in repair and refurbishing. Before your next move, give all your junk to Junk King Worcester. That’s a smart move indeed. This entry was posted in Worcester Junk Removal and tagged cluster, Junk King, junk removal, move on October 31, 2017 by Junk King. Last updated November 3, 2017 .